(l-r) Pocklington mayor Martin Ratcliffe, Claire Hamilton, Paul West and Rev Geoff Hollingsworth. More than 100 people tucked into breakfast at Pocklington’s All Saints’ Church to mark Fairtrade Fortnight. During Fairtrade Fortnight more than 60,000 people have had a fairtrade breakfast somewhere in the UK. About 130 people did their bit at All Saints’ Church last Saturday, and came to share not only the fairtrade tea, coffee and biscuits, but muesli, quinoa pops, bananas, grapefruit, oranges, clementines and orange juice. There was also marmalade, jam, honey, chocolate spread or peanut butter to have on toast. They were supported by Reverend Geoff Hollingsworth, Pocklington mayor, councillor Martin Ratcliffe and also East Yorkshire MP, Sir Greg Knight, who said a few words in support of fairtrade, encouraging people to spend a little extra to ensure that the people who produce our food get a fair price. Some of these products are available in Pocklington, others at larger supermarkets, at Fairer World in York, of from Traidcraft. The event was organised by Pocklington Fairtrade and Local produce Action Group (Pocklington FLAG). For more information call secretary Sue Taylor on 01759 305484 or email her at sue-taylor@gmx.co.uk. 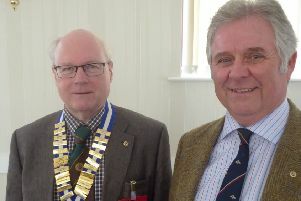 See this week’s (17 March) paper for more pictures from this event.